Wavelet compression is a special type of compression that has only recently been adopted into digital media compression. Instead of treating the image as numbers, the computer saves the file as a signal or wave. The computer then simplifies the wave by finding the average of the adjacent points and saving that which reduces the resolution by half. These averages are averaged and averaged again making simple waves. This is called decomposition. The simplified version is saved along with the information necessary to reconstruct the original. With such small data, the information can be encoded as a compressed image. The final image can be based on a simplified version, with only the most significant detail added back into the wave. Raster images are essential as they are one of the most common files types used in digital printing and camera images. This images type has a few common file formats such as, TIFFs, JPEG/JFIFs, and GIFs. 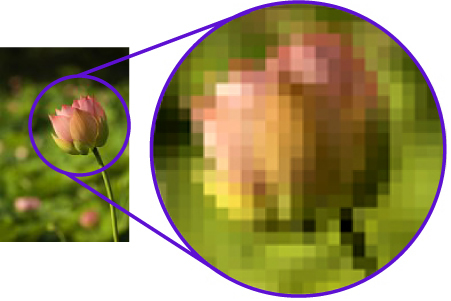 Raster images are internally very simple in terms of its code make up. If you look at the coding you will generally find some brief information describing the structure of the file and these having a series of numbers, each describing the colour of individual pixels. How to calculate what size you can print your image to obtain best quality.